Reproduction: Secret Weapon of the Dogfish? – Ya Like Dags? Spiny dogfish are one of the rare success stories in the management of shark fisheries, with the U.S. Atlantic population representing one of the few shark stocks ever to fully recover from overfishing. At first glance this doesn’t seem to make any sense: spiny dogfish are one of the longest-lived and slowest-growing of the sharks that regularly interact with human beings, and with a 2-year pregnancy it doesn’t seem as though they could replace their numbers in anything less than the decades that have gone by without successful recovery from several other heavily-fished sharks. So how have spiny dogfish been able to succeed in recovering from overfishing where so many other sharks struggle? The answer may very well be in adaptations related to that seemingly long reproductive cycle of theirs. The essential book Biology of Sharks and Their Relatives has a good overview of the reproductive systems found in elasmobranchs, and that’s where we’ll lay the groundwork for the potential reproductive edge of dogfish. Carrier et al. 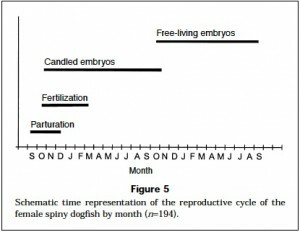 (2004) summarize that there are two different basic reproductive cycles found in sharks and rays. Both involve two different processes, the development of pups and the development of eggs. Where these cycles differ is the timing of egg development. In some sharks, including members of the large coastal shark complex like blacktip and sandbar sharks, pup development occurs, followed by the development of the eggs. Basically, only one reproductive stage happens at a time. The mother shark puts all her reproductive resources into developing the pups, then develops the eggs that will hopefully be fertilized to develop into the next pups. Factor in the “resting period” that usually immediately follows birth and you have a reproductive cycle that can be considerably longer than the length of pregancy. However, other sharks are capable of developing eggs simultaneously with pup development. This means that as soon as the pups are ready to head out, the next round of eggs is ready for fertilization. These sharks have the potential to constantly churn out offspring in as long as it takes to develop the pups. Tellingly, species showing this style of reproductive cycle include comparatively high-fecundity species like Atlantic sharpnose sharks, smooth dogfish (which may allow this species to be the most viable shark fishery out there), and our dear friend the spiny dogfish. Different stages of spiny dogfish egg and pup development, including multiple stages from the same dogfish. Image from une.edu. Unfortunately the above image is rather small, but each white tab along the bottom corresponds with one female dogfish dissected to observe the different developmental stages of both eggs and pups. The group of embryos second from left is especially telling: those are near-term pups almost ready for birth, and the eggs are already large and almost ready to take the pups’ place. This phenomenon was noted in Nammack et al. (1985) (the spiny dogfish life history paper that everyone cites, though some are making efforts to update it), which includes a few paragraphs about the fact that often eggs were developing in the ovaries at the same time that pups were developing in the uteri. This has also been observed regularly by fishermen as they clean their catches. However, the ability to start developing new pups as soon as the last round are out is only part of the puzzle. In order to really take advantage of this ability, fertilization of the new eggs has to occur as soon as the pups are born, or at least as close as possible. Hanchet (1988) theorized that this was possible given the timing of birth and fertilization in the New Zealand population of spiny dogfish, and determined that females aggregate with males offshore, where they release their pups and immediately get back to the business of making new pups. Bringing it back to the Atlantic, Jones and Ugland (2001) noted evidence for the same behavior in the spiny dogfish in Norwegian waters, and even provided a handy figure illustrating the timing of pup development, birth, and fertilization. I’ve even made a personal observation on this subject: during my field work there were a few deepwater tows off of Delaware that included an even mix of male and female dogfish and a healthy number of newborn pups (I mention it in this post). The figure caption says it all. From Jones and Ugland (2001). There are number of take-home messages from this. The first is that, like stereotypical good Catholics, spiny dogfish try to crank out babies as fast as their reproductive biology will allow. The second is that, unlike just about any other shark I can think of, the pupping and mating grounds of spiny dogfish are potentially the same place. Which means that it’s possible that the first thing a spiny dogfish pup sees after birth is its parents doing it. Spiny dogfish appear to have evolved an “assembly line” style of reproduction that just may be the edge over their bigger, more conservatively reproducing relatives that has allowed them to rebound from fishing pressure with surprising (some would say alarming) quickness. This interesting reproductive behavior doesn’t necessarily explain the whole story, but is certainly a clue to the continued success of the spiny dogfish. For one thing, though these adaptations may offset that long gestation period, the fact is that it’s still a 2-year cycle. Fortunately, this isn’t the end of inquiry into the fairly unusual reproduction of the spiny dogfish. The Rulifson lab at my current home port of ECU is working on that as we speak, as well as the Sulikowski lab at the University of New England in Maine. I’m starting to believe that dogfish may secretly be the most interesting sharks in the sea.